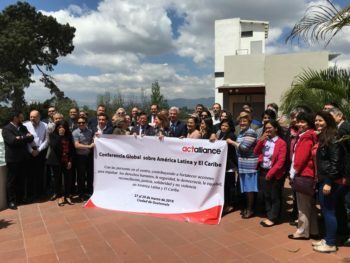 More than 50 people from 21 countries across Latin America and the Caribbean, North America and Europe gathered this week in Guatemala City for ACT Alliance’s Global Conference on Latin America and the Caribbean. Representing ACT, ecumenical organisations, UN bodies, and churches, the participants met from March 27-29 to discuss the range of issues which combine to present a significant crisis in the region. Today, the conference issued a statement of its results and commitments. Climate change, multinational extractive corporations, mass migration, and other problems also affect the region. Establish regional and global networks to accompany the political and social crises in Latin America and the Caribbean. Promote and support the voice and strategies of churches and faith-based organizations in a time of shrinking civil society space, while influencing regional and global organizations. Accompany the communities in their processes of accessing justice at the local and regional levels, supporting their demands and claims. Strengthen joint action with United Nations agencies and programs to promote regional and global initiatives on gender justice and against all forms of violence. Challenge impunity and the reduction of civil society space, while unmasking harmful and corrupt practices and protecting rights-holders. Strengthen internal spaces such as communities of gender justice practice to generate visions and joint actions against religious fundamentalism and injustice. Ensure that human rights and environmental defenders are protected. Produce evidence of violations of rights so that it reaches the governments and human rights institutions. Strengthen the voice of children and youth, so that they are full rights-holders in law. Read the full statement here in English or Spanish.